The episode starts with Coulson hooked up to a hospital bed. Deke and Piper talk in the hallway while the team argues. Yo-Yo eventually takes the serum and Mack has to prevent a fight. He tells Yo-Yo that they all have to hold onto hope and he wants to put it to a vote. May destroys that option by destroying the odium. May apologizes to Yo-Yo as she falls to the ground crying, but I have to invoke Rule 42 here. “Never accept an apology from someone who just sucker punched you. Talbott is still trying to talk to Robin. She doesn’t think he’s a hero. He takes her mom away and Robin thinks that it’s the last time. Mack and Yo-Yo talk. She thinks that he’s going to die and she’s afraid. He’s not. Yo-Yo clears the air with Coulson. He says that he was on her side. Deke and Daisy talk. He’s leaving. He wants to see the world before he blinks out of existence. He says that Daisy needs to fix the team if she’s going to be able to lead them. Simmons has the serum, but May wants to be alone with Coulson. She tells him that she’s giving him a choice whether or not to take it. Talbott finds what he’s looking for and pulls out a long section of the Earth until he gets the gravitonium at the core. Then he crushes it. When they are 10 minutes out, Daisy talks to Yo-Yo. She still thinks she was right but apologizes for letting her emotions get in the way. She doesn’t think she can lead and nominates Mack. Everyone approves. I approve. Mack is the only one responsible enough to be around power. Coulson agrees. Chicago PD are about to engage Talbott when everyone gets a S.H.I.E.L.D. alert. There is an aircraft for evacuation and do not engage Talbott. May and Mack find Robin, who tells them about her mom. Mack goes into Talbott’s ship to get her. Coulson didn’t take the dang serum. He wants Daisy to either talk to or beat sense into Talbott. She’s super ticked at him, but they don’t have much time to argue. Fitz makes the wonderful observation that neither of them are in the future. Daisy tries to talk some sense into Talbott, but her speech is apparently too much like Hale’s and Coulson’s, so he doesn’t respond well. He grabs her and starts to fly. May and Fitz provide backup to Mack and help get them out. Robin sees her mom, and they get out. Davis finds Coulson slumped over. Talbott pushes Daisy back to the ground, which brings down a pile of rubble onto Fitz’s head. 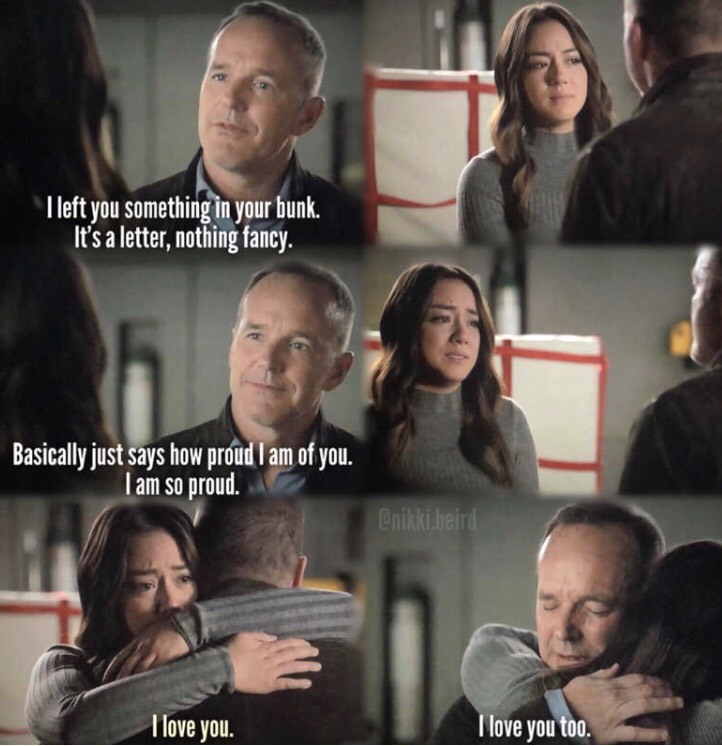 Davis brings Coulson to Jemma. Yo-Yo apologizes and gives chest compressions. Robin says that something is different. Then time slows down as Daisy reveals that Coulson put the serum in her gauntlet. She stabs herself and breaks free from Talbott. Then she quakes him into space. Mack and May get Fitz. Talbott is floating dead in space. Fitz has been stabbed, and Mack talks to him until he passes out. THEY DID NOT JUST KILL FITZ. HE DESERVES BETTER!!! FITZSIMMONS DESERVE BETTER!!! THEY CANNOT DO THIS!!! 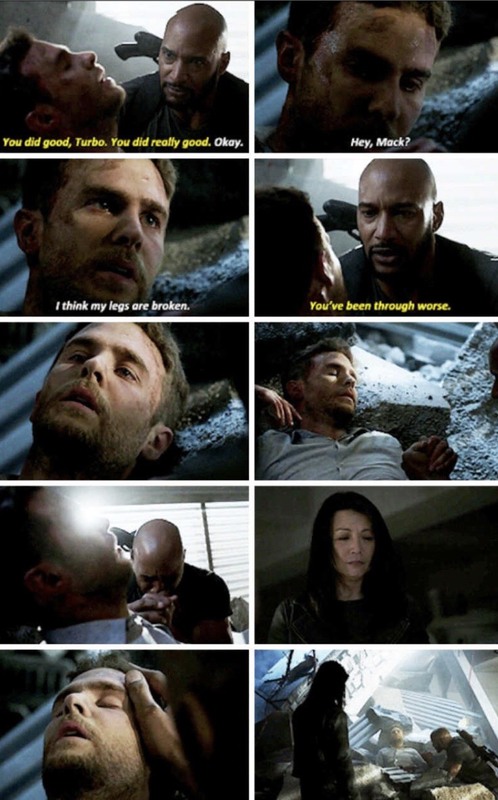 Simmons is with Coulson when Mack tells her. We see a gravestone. Simmons is leaving, and she’s taking the pocketknife with her. Daisy burns Robin’s drawings. May crushes the monolith piece and then makes drinks. Coulson makes a speech and then we find out that it’s a retirement party, not a funeral. THEY’RE GONNA FIND FROZEN FITZ!!! AND THAT’S GREAT BECAUSE HE DOESN’T HAVE THE DOCTOR INSIDE HIS HEAD AND WE GET TO SEE ANOTHER FITZSIMMONS WEDDING AND MAYBE HUNTER! Simmons gives Coulson Fitz’s postcard and they all drink. Yo-Yo hugs Coulson. He tells Mack that he’s going to throw his phone in the ocean. He tells Daisy that he has days, maybe weeks? He left her a letter in her bunk and they say that they love each other. Awwwww. Then he walks onto a beach and they leave him. It’s Tahiti and May is with him and they hold hands and it’s perfect. They scared the everloving crap out of me, but there is another less damaged Fitz and Coulson isn’t dead, so I forgive them. Another season gives them time to work all that out. See you all next summer! 9/10.